After nearly 80 years, the Flying Fortress still has tales to tell. That’s how the pilot of the B-17, Madras Maiden, described the horrors that the Flying Fortress’ crewmembers faced flying missions into Nazi Germany during World War II as we climbed into the nearly 80-year old Boeing heavy bomber. 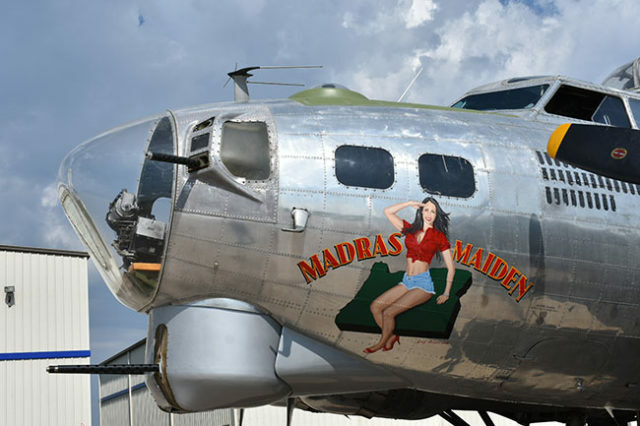 The Madras Maiden, a B-17. My interest in the ten-man-crewed bomber began long before when I became acquainted with the most famous B-17 of them all, Memphis Belle, and later became even more fascinated by the Flying Fortress when I had a chance to tour the National Air Force Museum at Wright Patterson Air Force Base, in 2006. Maybe it was the sleek lines of the 65,500 pound four-engined plane, the intimidating pictures of hundreds dotting the sky in formation, or the stories of crewmen who grew up much too quickly; whatever it was, I have been in love with the plane ever since I was a kid, and I have dreamt of getting to ride in one. That finally came true recently. On its fifty-city nationwide tour, The Liberty Foundation’s B-17G Madras Maiden stopped in Wichita, KS, where I was fortunate enough to ride on it. Every part of the experience, the preflight brief, the “mission,” and the post flight disbelief, was far better than any movie, book, or museum could portray the aircraft. There I was in it. The engines roared to life and emitted a cloud and an oily scent into the cabin, through the open bomb bay, supplementing the already hyper-realistic mission scenario replication. After a quick taxi and turn onto the active, the pilots put the engines to work and the bomber quickly took flight (aided by being thousands of pounds lighter than it would have been during the war, laden with bombs). After passing through 2,000 feet AGL a volunteer gave us riders the thumbs up to roam about the aircraft and experience history. After unbuckling my WWII-era seatbelt, I stood and then made my way past the ball gunner position (I still cannot fathom how unbearably uncomfortable an eight-hour sortie must have been in that far-too cramped war seat). After climbing into the next section, I was hit with the 165-mph cruise wind that came through the open roof of the radio room. This provided an excellent view on the otherwise dreary Kansas day, but it was far from the best seat in the house. After taking in all that the communications bay had to offer, I “walked the plank” (while holding rope railings) across the closed bomb bay and found myself at the split-level platform topped by the flight deck with the nose gunner position on the level under it. After spending some time studying the pilots flying the plane and retracting my gaze from the mesmerizingly simple and beautiful cockpit, I took a few steps down the stairs, where I found myself in what the pilot lovingly referred to as the “vista compartment,” otherwise known as the nose of the aircraft. Enclosed by 180 degrees of plexiglass, the nose provides unrivaled views of the landscape below and is an easy location for riders to daydream in. Had this been seventy-five years earlier and had it been Nazi Germany instead of modern Kansas, a twenty-one-year-old Grant Boyd would have been far less fond of the view, hoping that I would not become one of the tens of thousands of crewmembers of the nearly 5,000 B-17s that were shot down during the war. The phrase “freedom is not free” is one I’ve always appreciated before this flight, but it was while I was scanning the countryside below me that I was reminded that there are hundreds of thousands of men and women that I’ve never met who fought for our freedom. I am eternally indebted to each and every one of them for their sacrifices. And I’m grateful beyond words that The Liberty Foundation takes such great pains to ensure that these heroes are remembered, by preserving and flying the incredible machines in which they went to war and from which war so many never returned. Do you have a great story about a time when you got to cross an item off of your aviation Bucket List? If so, we’d love to hear it! Check out the Bucket List submission details and send your story to [email protected]. 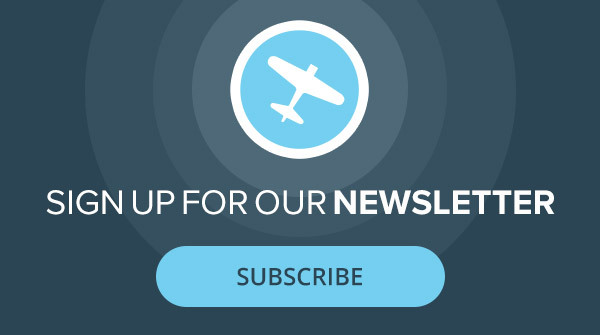 In the meantime, you can find more aviation adventures in our Bucket List archives.